OK, you want to know how Solo Ads sell. This is it, short and sweet. 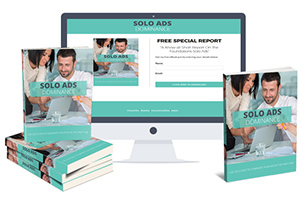 Writing your Solo Ads, not rocket science... at all. This article itself is a visual example of what good solo ads look like. It's a little longer that most solo ads are but hey, it's an illustration of one. Bullet point your Solo Ads just like you see here. Solo ads are all about skim reading. People cruse through them at warp speed so make a bullet point and back it up really quick. Your Solo Ad titles, easy as one, two, three. Solo ads with great titles will sell your product. Just look at the headings here in bold text. They're basically section titles. You’re still reading so it's working. That's what you what your solo ads to make people do, read them! Then you'll sell big time. Say it. Don't hold back, Say it! Hey guess what? You can put your web site address in your solo ads more than once. Why not increase your chances of people visiting your site and opting in? Call me to action baby! When your solo ads have strong "calls to action" or combinations of persuasive words, that's what gets people to your web site. It's a good idea to put a call to action just before your web site address each time you include it in your solo ad. Domain names, a slick Solo Ad selling trick.